Leroo La Tau rises majestically above the Boteti River which stretches across the western border of the Makgadikgadi Pans National Park. The park, populated by up to 30,000 zebra and wildebeest closely accompanied by predators, offers guests the chance to experience the exhilaration of seeing large concentrations of game and the resultant predator interaction. 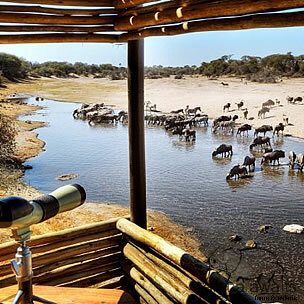 The lodge offers a raised hide above the river where guests can enjoy the spectacular wildlife sightings that we’ve come to expect in this part of Botswana. 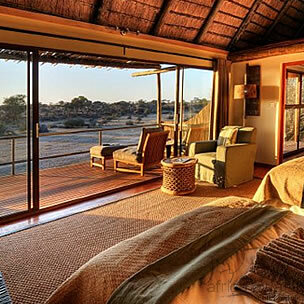 With just 12 thatched chalets, each with en-suite bathrooms, a dining room, reading room and bar in the main lodge, expansive wooden decks and a plunge pool, guests can immerse themselves seamlessly into the ultimate wildlife experience in Botswana. 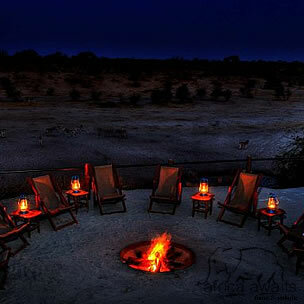 The lodge offers both scheduled guided day and night game drives. Depending on the water levels of the Boteti River, boat activities can also be provided. Optional cultural excursions can be arranged to visit Khumaga Village, as can guided nature walks in the area surrounding the lodge. Leroo La Tau translates as ‘lion’s paw’, but although the surrounding area features abundant lion, zebra and wildebeest, it also boasts Chobe bushbuck, leopard, cheetah, brown- and spotted-hyena, impala, kudu, jackal, porcupine, genet and caracal, to name but a few. In addition, there is also the possibility of seeing the rare white rhinoceros. Please note: Due to their remote location within the Makgadikgadi Pans National Park, the physical Makgadikgadi Pans are not visited on daily scheduled activities from Leroo La Tau. Your stay at Leroo La Tau is inclusive of accommodation, all meals, local brand drinks, scheduled game-viewing activities, emergency medical evacuation insurance to regional medical facility, and a complimentary laundry service for guests staying more than one night. Tips, gratuities and premium brand drinks. Guests are welcome to buy items from our Curio Shop and any forgotten items of a personal nature can also be purchased at the lodge. With your holiday, safari or business trip from in to Leroo La Tau in Botswana.